Edvard Hagerup Grieg (born 15 June 1843 in Bergen, Norway; died 4 September 1907 in Bergen, Norway) was a Norwegian composer and pianist who composed in the Romantic period. Grieg was raised in a musical home. His mother, Gesine, became his first piano teacher, who taught him to play from the age of six. He studied in several schools including Tank's School, and often brought in examples of his music to class. In the summer of 1858, Grieg met the eminent Norwegian violinist Ole Bull, who was a friend of the family, and whose brother was married to Grieg's aunt. Bull noticed the 15-year-old boy's talent and persuaded his parents to send him to further develop his talents at the Leipzig Conservatory, then directed by Ignaz Moscheles. In 1863, Grieg went to Copenhagen, Denmark, and stayed there for three years. He met the Danish composers J. P. E. Hartmann, and Niels Gade. He also met his fellow Norwegian composer Rikard Nordraak (composer of the Norwegian national anthem), who became a good friend and source of great inspiration. Nordraak died in 1866, and Grieg composed a funeral march in his honor. 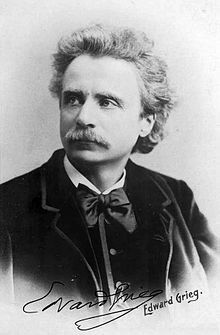 Grieg had close ties with the Bergen Philharmonic Orchestra (Harmonien), and later became Music Director of the orchestra from 1880–1882. From 1866 to 1874, Grieg resided in the Norwegian capital, Oslo, where he worked as a private teacher and a conductor and served as one of the co-founders of a short-lived Academy of Music. In 1868, Franz Liszt, who had not yet met Grieg, wrote a testimonial for him to the Norwegian Ministry of Education, which led to Grieg obtaining a travel grant. The two men met in Rome in 1870. In 1876, Grieg composed incidental music for the premiere of Ibsen's play Peer Gynt, at the request of the author. In 1903, Grieg made nine 78-rpm gramophone recordings of his piano music in Paris; all of these historic discs have been reissued on both LPs and CDs and, despite limited fidelity, show his artistry as a pianist. Grieg also made live-recording player piano music rolls for the Welte-Mignon reproducing system, all of which survive today and can be heard. Grieg’s stature as “Norway’s greatest composer” is generally recognized, but Grieg’s status as a “great” composer without the Nationalist modifier is not so generally acknowledged. Part of the difficulty in making a case for Grieg’s greatness as a composer is the relative paucity of knowledge among the general concert going public about his music outside of the Peer Gynt Suites and the Piano Concerto; composers of the succeeding generation, though, seemed to know his music well. Debussy and Bartok were influenced significantly by Grieg’s music. William Halverson traces Grieg’s influences to “Sibelius in Finland, Carl Nielsen in Denmark, Delius in England, Grainger, MacDowell, and Gershwin in the United States, Debussy and Ravel in France, and Bartók in Hungary.” Halverson asks, “Have not certain features of Grieg’s harmonic style had some impact on twentieth-century popular music and on certain film music composers?” Certainly Grieg’s harmonic influence can be heard in the work of film composer Hans Zimmer, as well as in fellow film composer Howard Shore’s score to The Lord of the Rings trilogy (which includes as a significant solo instrument - the Norwegian Hardanger fiddle). Finck, Henry T. (1906). Edvard Grieg. Digital Text. Finck, Henry T. (1909). Grieg and His Music. Digital Text. Lee, E. Markham. (1908). Grieg. Digital Text. This page was last edited on 4 October 2016, at 08:42.